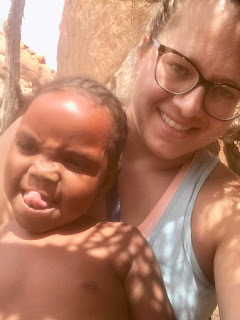 On day 12 (it still feels surreal to say that…I can’t believe there is a day 12 of 21…and that day 21 is over), we visited an area called Damaraland, where the Damara people feature a living museum of how their people lived. Some of the Damaras live this way today, but it gets complicated. In many cases, the bushmen have been driven out as it is illegal to kill any of the game animals and the government wants to have any of the young children in school. More recently, there are organizations and NGOs set up to preserve their culture, but as there are several different cultures in Namibia (i believe the number was around 11 or 12) it’s difficult to preserve them all. The Damaras set this “Damaraland” living museum up to raise funds, raise awareness, and to show tourists how they once lived, and how they continue to live in part. Now - I have to be brutally honest. 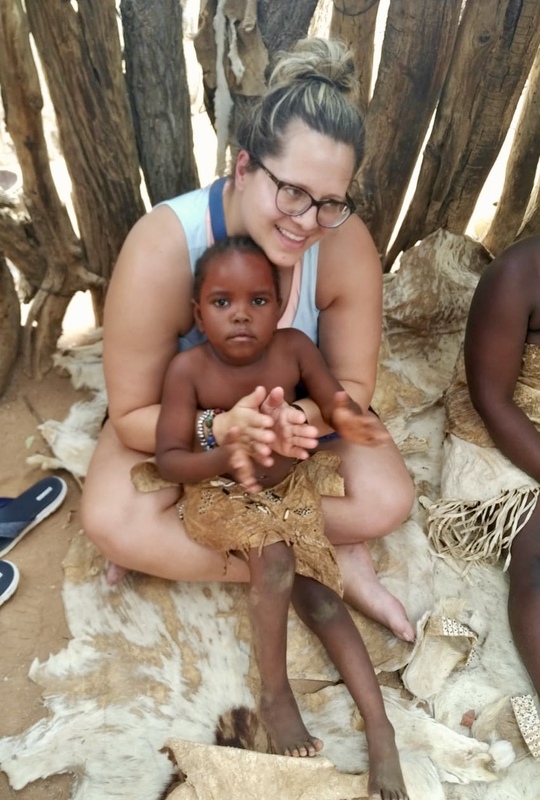 I was very interested in the first…two or three bushmen tribes that we visited. It was amazing to see how they lived off of the land, killing animals regardless of the laws (many bushmen end up in jail), and how they use herbs and plants to cure themselves (we all took one herb to starve off malaria - awesome for me because I relied only on DEET and didn’t take any medication) (actually, several people had to stop taking their malaria medication after a week or so because of the secondary effects of the medication. I tell ya it’s a killer. Moving on). But in Damaraland, I was like an impala roasting over a spitfire. 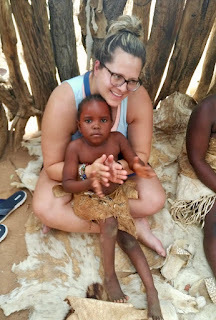 (Note: I do have a post coming up about one of the first bushmen groups that we visited. That was the first one we visited and to me, the most interesting). We were in the desert. It was hot. I had stomach issues (meaning I was going all the time and trying to keep it under wraps). I think the night before I just went to bed without eating supper because I was so exhausted that I couldn’t handle anything but drinking water. And..while I wanted to pay attention to the tour, I was so tired. I was so hot. And I was feeling especially out of sorts because (and I didn’t know this before), we had dropped off five people from our tour in Windhoek, Namibia, and picked up eight people, who would start their tour there. They were all German speaking, and it felt like…the tour was kind of disjointed. I really liked the vibe of our old tour…and I couldn’t quite figure out the vibe the the “new tour” and couldn't quite get into the swing of things. Moving on. I went and did a bushy-bushy (the world became our washroom). I was a little late for the tour. I rounded the corner and saw this. Ok! Forgot that the Damaras like the open breeze! The tour leader introduced herself. I can't quite recall what her name was, but everyone had a "click" in their name. Yes, this fascinates me and it always has. We made our way to the the first area where we watched how they make different types of knives. There was a little boy playing in the sand, drawing mainly. I showed him how to draw the sun. A little girl came over right away, and I showed her how to draw the sun in the sand. She loved this. We did it a few times. I didn't want to be rude, but I found the interaction between the little girl and I far more interesting that the knife making lessons. We went to the next stations. There were cowhides on the ground with the locals sitting on the ground. It seemed like the rest of our group was a bit shy...but I asked if I could sit with the locals on the cowhide. We had already been taught how to say thank you, so I thanked the ladies as they pulled up a cowhide for me and I sat cross-legged, prepared to listen to the next demonstration when, BOOM, the little sun-drawing girl came into my lap, and put my arms around her, and wanted to play with my hands. She wanted me to clap, she wanted me to hug her, she wanted to just...I don't know, see what big white people hands were like? I asked my camping-mates to take some photos...we couldn't get any of them with her smiling, I think she was a little intimidated getting a camera shoved in her face, but later on, as she climbed into my lap, or held my hand, or stood in front of me and put my arms around her, she was big into the selfies and making faces. She was also pretty good at flipping through my phone looking at photos...so I don't think this is the first time she's seen a iPhone on an iPad in her little life. She just chose me, and would make a noise if I wasn't fast enough to walk so that she could hold my hand. I found out that her name was "click" Lulu... and she waited for me at the end of the line...and as I boarded the bus, I felt energized and special, and...well, I lost that feeling of unimportance. 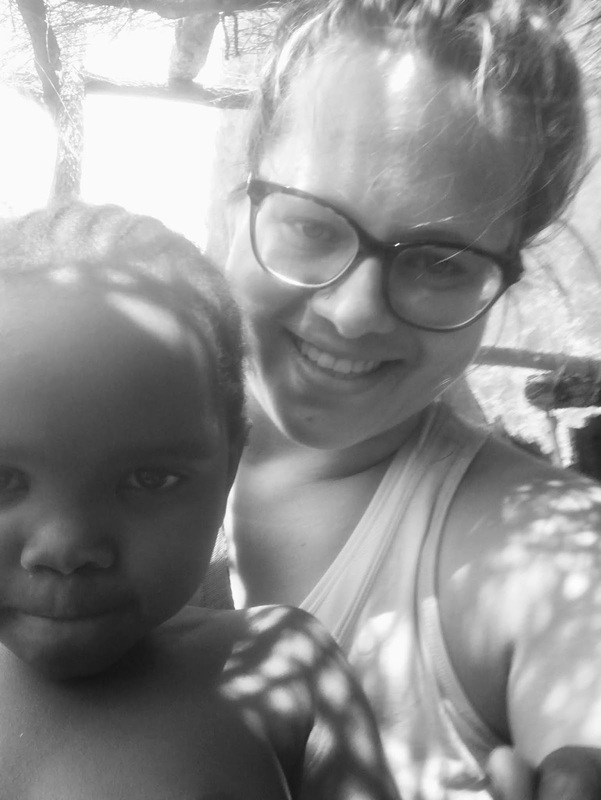 I also felt sad since I would likely never see this little girl again. So, I took a moment. I will likely never seen you again and if I do, I wouldn't recognize you. I'm sorry, but I barely paid attention to the demonstrations that your family was showing us, but I paid attention to you and I needed you so much during that hour. I had been feeling so down and isolated...unimportant and struggling to keep up and struggling to do things alone. I feel like you saw something in me, and you knew that I needed to feel special and important and loved, and that's exactly how I felt. I wish I had a gift to give you, to remind you of me, to show you how wonderful and how caring you are. I wish I could have given you the world then....I wish I could have found a way to keep in touch. (Actually...that might be one of my goals when I get home. It may be possible.). Thank you for waiting for me at the end of the line, so that I could give you a big hug. You're probably too little to understand how special you made me feel and what a difference you have made in my life, but you, little girl....are someone that I will remember forever. Thank you for the amazing gift that you gave given me today. And that's one of the dozens of moments of Africa magic.